Gapers Block - To be Demolished: 1950 N. Burling St. Permit Description: Wreck and remove a 3-story 6-unit building and garage. As the sign proclaims, this Italianate orange-rated building will be demolished to make way for a new "custom built home" on an "oversized double lot." The firm behind the development is BGD&C, who is marketing the parcel to build a house as large as 17,000 square feet. 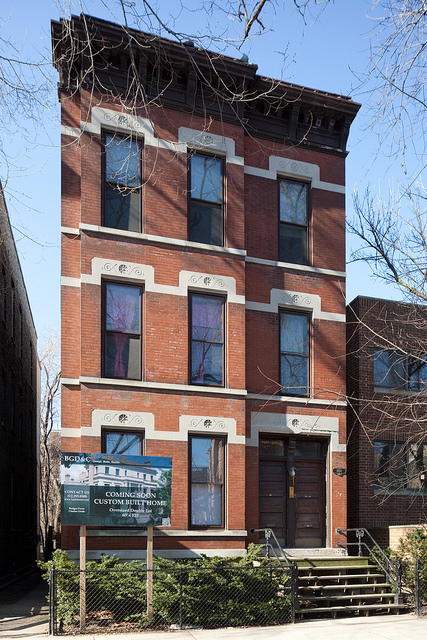 The firm previously listed a proposed home for this site and 1948 N. Burling for $9.5 million. Given previous plans, the demolition of 1948 will likely shortly follow. The new house will be just down the street from the Richard Parrillo, Sr. residence, helping reinforce Forbes' claim that the block is one of the most expensive in the country. Town & Country's travel section states the reason for the unusual sized buildings is a "[l]apse in landmark protection and zoning that allows 2.2 square feet of structure for every 1 square foot of land--more than double what is permitted elsewhere in the city."